Not so long ago, if you wanted a big estate car you had to put up with it using a moderate amount of diesel or a lot of petrol on every journey. The rise of the plug-in hybrid estate has changed all that and given the propensity for their conventional brethren to down hydrocarbons, they are a very well addition to the market. 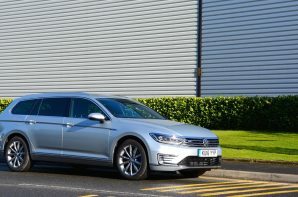 In this case it is the Passat Estate that has benefited from the electric makeover. The VW system uses a slim electric motor sandwiched between a 1.4 TSI turbo petrol engine and a six speed DSG gearbox. Clutches allow the electric motor to work independently to the petrol unit or their outputs can be blended together. A 9.9 kWh (gross) battery pack provides enough juice for up to 31 pure electric miles, with 24 – 31 miles being realistic in the real world. With both systems working in unison performance is brisk, but thanks to the inherent efficiency of electric motors the slimline unit can power the Passat by itself up to 81 mph which means that you can venture onto the motorway without waking the TSI engine. This in combination with the sensible electric range will allow many owners to cover daily tasks in electric mode. As ever how much fuel you use is very dependent on how often you can plug in. However unlike many of the big SUV based plug-in hybrids the Passat achieves good fuel consumption running in hybrid mode even on long motorway runs. During our week with the car we recorded 47.5 mpg on motorway runs and the average for the full week was 59.2 mpg, which is an excellent result for a big petrol estate car. Talking of being an estate car, you may be interested in how much stuff the Passat will cart around. There are many upside to the electric bits but integrating the battery has had an impact on boot space. With no underfloor compartment you get 483 litres to play with rather than 650 litres in the standard car which means that the boot isn’t as big as you might be expecting but it remains big enough to justify the estate body. If you are looking for a large estate car the GTE makes a lot of sense thanks to a good electric range and the ability to achieve excellent fuel consumption in hybrid mode it has all bases covered. It isn’t desperately exciting to drive but the electric motor does make it more interesting than a conventional Passat and it is also more refined, particularly in EV mode.